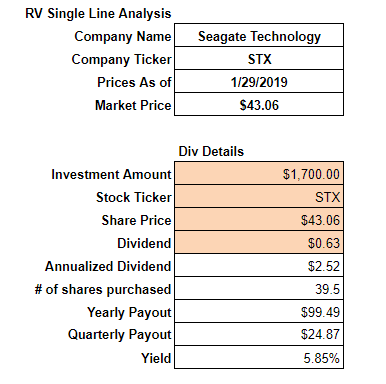 Dividend Purchase: Seagate Stock Analysis 2019 - Buy or Sell? 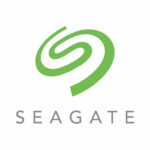 Seagate Technologies ($STX) came across as an interesting prospect on my screening tool. It offers a high dividend yield of 5.85% and is trading at an attractive PE valuation of 8.56x. Being that the entry point seems attractive, it is time to put this stock through ‘The Spread’ and see if the Seagate stock might be one that I want to deploy my hard-earned capital into. My first order of action is to always know the effect a purchase will have on my Annual Dividend Income (ADI). Ideally I am looking for stocks that are 3%+ in yield and lower in price as this means quicker share accumulation. 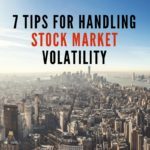 I have nothing wrong with purchasing higher priced stocks – in fact, I recently added 3M into my portfolio at $191.55, however, it takes much longer to accumulate shares at these price points. Seagate Technologies currently offers an entry point where if all else holds true, I will accumulate roughly two extra shares of the stock per year via DRIP accumulation. Quite a lucrative proposition. I have decided on a $1700 initial investment. I was stuck between $1500 and $2000, so I decided to ‘split the middle’ for my entry investment amount. Since STX passed the initial dividend analysis, it is time to look into the high level numbers. 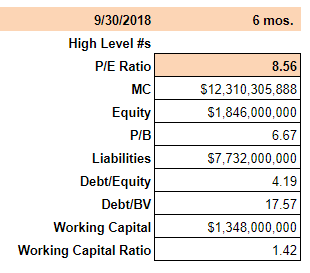 PE Ratio – I like the PE ratio at 8.56x. I typically target sub 15x, so this is right in my arena. Working Capital – I like to see WC as positive. This helps me know that the company can afford to pay its dividend through an ample liquid position. Debt/Equity – This is the challenging metric for me. STX currently has higher debt levels than I like to see in my investments. This is a potential deal-breaker. 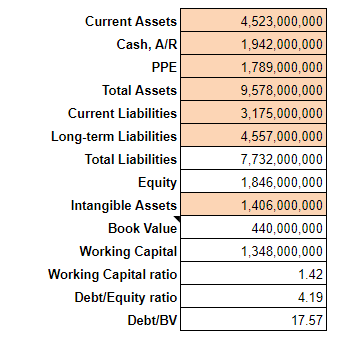 Overall the balance sheet is in good condition. The only thing that is concerning to me as an investor is the high levels of debt. I will be watching this moving forward as I hope to see a decrease in these debt levels. Profitability is in line at Seagate. Revenues have been fluctuating and declining somewhat, which will be something I will be watching in the coming years. 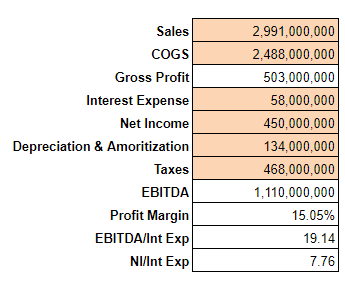 Overall though, the interest expense coverage is solid and EBITDA at $1.1B is great to see. This is where I put much of my weight on the financial health of the company. If the operation is generating cash through operations, then most of the time, all is well. If cash is being generated through debt or equity financing, then there are potential issues. STX is a solid cash generator. 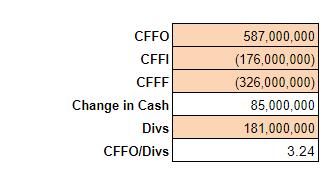 It has been able to cover its dividend payment through cash flow from operations (CFFO) for the past few years. Being that this is the case, I have confidence that the dividend will continue to be covered into the foreseeable future. Overall, the dividend checklist is in looking pretty solid. The company has good financial metrics – working capital and cash flow is positive. Of concern is the lack of a moat and a higher debt/equity ratio. More on this later. DRIP is one of the most powerful devices known to the common investor. Through this mechanism, we can accumulate more and more shares through passively holding our investments. This spreadsheet is limited in the fact that it assumes a stable share price and dividend over the course of its life. However, the truth holds simple; in 12 years, if I do nothing and everything else holds true, I will see a doubling in my ADI. One big positive is that Seagate manufactures enterprise HDD drives. These are often more cost efficient than the SSD models, so I don’t see this specific sector going away any time soon. There are starting to be hybrid models on the market, which is where I can see the general market heading. The “bread and butter” of Seagate has been its HDD business, which will eventually disappear. 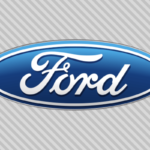 However, the company is making the foray into the world of SSD and will continue to deploy its cash flow into R&D. I can see a world where HDD wanes in significance, however, being that this tech is part of the cloud system, I believe the cash flow will continue to remain consistent. Both hard drives and solid state drives are commodities in the general market. There really isn’t a competitive advantage in one drive manufacturer over another. Perhaps that will change, however I see the ‘moat’ non-existent or perhaps even going away sometime in the future. HDD tech is the ‘old’ way of doing things. It is now SSD. However, the shift will be gradual as HDD is cheap and SSD is expensive. One saving grace is that HDD tech will still be used in some form via cloud based enterprise solutions. If that continues to happen, then I can see Seagate remaining viable for years to come. Overall I like the proposition of owning Seagate Technology ($STX) stock. It offers a good cash flow, steady dividend, and a good working capital position. 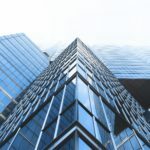 It will need to continue adapting to the competitive hard drive space and utilize cash flow to invest in new technologies that will keep it viable in the years to come. I ended up pulling the trigger and deploying $1,700 worth of capital into this technology play. My dividend portfolio is now up to 24 positions that generate $3,367.46 in annual dividend income! Be sure to sign up for our Live Free and Div Hard Email List as we build our way to $50,000 in passive income per year! Thanks for sharing your recent buy. You captured a nice yield with this pick up and as you mentioned I don’t see HDD going away any time soon. There’s still plenty of runway left in this legacy business plus I’m sure STX will foray into the solid state market in earnest as time goes by. Keep adding that passive income! Thank you DivHut! Good luck to you too and keep earning!